National Historic Landmarks (NHLs) are nationally significant historic places designated by the Secretary of the Interior because they possess exceptional value or quality in illustrating or interpreting the heritage of the United States. Below is a list of the 29 National Historic Landmarks you can find in our California State Parks. National Historic Landmarks (NHLs) are nationally significant historic places designated by the Secretary of the Interior because they possess exceptional value or quality in illustrating or interpreting the heritage of the United States. Asilomar was designated a National Historic Landmark in 1987 for the significant role it played in work of the YWCA, in the establishment of the Monterey Peninsula’s resort industry, and as an outstanding example of the master architect Julia Morgan’s work. At the end of the 19th century, the Young Women's Christian Association (YWCA) provided accommodation for the young women who left the rural countryside for cities in search of low-paying jobs in factories and offices. The YWCA established educational and vocational classroom facilities, where these young women could improve their prospects by taking classes in practical subjects such as money management, sewing, cooking, and typing. Led by Phoebe Elizabeth Apperson, the YWCA purchased land in 1911 and hired architect Julia Morgan to design a camp that could both provide educational opportunities and a conference center for the association’s members. Established in 1913, Asilomar included a dining hall, meeting spaces and dorm rooms. Although the YWCA maintained the facility until 1951, it was operated as an educational camp until the depression and a conference center in the 1940s. Asilomar is now part of the California State Park system as Asilomar State Beach and Conference Center. People continue to gather in the historic buildings and inspirational landscape for conferences and meetings in the historic buildings. National Historic Landmarks (NHLs) are nationally significant historic places designated by the Secretary of the Interior because they possess exceptional value or quality in illustrating or interpreting the heritage of the United States. Designated a National Historic Landmark on July 4, 1961, the “Big Four House” was threatened by a redevelopment project that razed the entire block in 1967. It was moved out of redevelopment area and relocated to the north side of I street between Front and Second Streets to preserve this important piece of railroading history. The building known as “Big Four House” was originally three separate buildings, the Stanford Building, the Huntington & Hopkins Building, and the Miller Building. Constructed adjacent to the original Sacramento Railway Station in 1851 and 1852, the buildings provided retail space and offices. The first floors of these three buildings were used by merchants and the second floors were eventually finished as one floor occupied by Hopkins, Stanford, and Crocker’s railroad enterprise. For the first eleven years (1862 – 1873) the Central Pacific Railroad was operated from the second floor offices. By 1878, the individual buildings were united and over the years hosted retail shops, a hotel, a bar and a café. Today the “Big Four House” is shared by the California State Park Capital District offices and the California State Railroad Museum Library where researchers can discover the history of the railroads through original and rare documents. National Historic Landmarks (NHLs) are nationally significant historic places designated by the Secretary of the Interior because they possess exceptional value or quality in illustrating or interpreting the heritage of the United States. Bodie was designated a National Historic Landmark in 1961 for its significance as the finest example of a mining “ghost town” in the West. Bodie, once a bustling community of gold miners, with salons, hotels, shops, churches, and public buildings, experienced the rhythms of boom and bust that are common in mining communities from 1859 to 1942. During the peaks of gold mining, Bodie had up to fifty mining companies operating simultaneously with thousands of miners and thousands more people providing services such as meals, laundry, brewing, and metal work to the miners, their families and the companies they worked for. During the 1880 federal census 5,275 individuals were listed as residences of Bodie. They represented 43 states and territories, and 31 different countries from Arabia and Australia to Russia and Wales. Italian, Irish, English, Polish, Mexican, Swiss, and Chinese immigrants mixed with Paiute Native Americans and people born in every state in the nation. By the 1940 census, only 122 people claimed to live in Bodie. However, the diversity of the population remained and represented 24 states and six different countries. Today, the park is visited by an annual average of 200,000 people from around the world. National Historic Landmarks (NHLs) are nationally significant historic places designated by the Secretary of the Interior because they possess exceptional value or quality in illustrating or interpreting the heritage of the United States. The Estudillo House was designated a National Historic Landmark in 1970 for its significances as one of the oldest and finest examples of a Spanish-Mexican one-story town house in California. The Estudillo House was constructed over a three year period from 1827 to 1829 in San Diego. The residence has a U-shape and features hand-hewn timbers and rafters secured with rawhide thongs. Don Jose Antonio Estudillo was a captain at the Presidio of San Diego. He was granted a residential lot where he constructed the adobe house. Today the Estudillo House is in the heart of Old Town San Diego State Historic Park which receives almost six million annual visitors drawn to the blend of history, culture, and strolling among the numerous shops. The Estudillo House was designated a National Historic Landmark in 1970 for its significances as one of the oldest and finest examples of a Spanish-Mexican one-story town house in California. Constructed over a three year period from 1827 to 1829, the residence has a U-shape and features hand-hewn timbers and rafters secured with rawhide thongs. Don Jose Antonio Estudillo was a captain at the Presidio of San Diego. He was granted a residential lot where he constructed the adobe house. By 1829, Estudillo had acquired three ranches and was an influential member of the community, later serving as mayor and justice of the peace of San Diego. The Estudillo residence became the an important part of life in San Diego, church services and school classes were held in the hall until the 1850s and it was a place of shelter for women and children during times of revolution and war. The house remained in the Estudillo family until 1887 when it was abandoned. John D. Speckles purchased the ruined remains of the house in 1905 and began restoration work which was not concluded until 1969. National Historic Landmarks (NHLs) are nationally significant historic places designated by the Secretary of the Interior because they possess exceptional value or quality in illustrating or interpreting the heritage of the United States. The Historic District of Coloma was designated a National Historic Landmark in 1961. The town of Coloma, located along the south fork of the American River, grew around Sutter’s Mill, the site of gold discovery that began the greatest series of gold strikes in the North American continent and the global migration of miners and adventures to California. The mining camp evolved into a town and survived the depletion of gold in the 1850s by turning to agriculture. Today the remaining residences, businesses, and landscape testify to the pioneering spirit and lifestyle of the early residents and the Marshall Gold Discovery State Historic Park gives visitors the opportunity to discover California’s rich history through living history events, exploring local Native American culture and the diversity of the gold mining era. National Historic Landmarks (NHLs) are nationally significant historic places designated by the Secretary of the Interior because they possess exceptional value or quality in illustrating or interpreting the heritage of the United States. Columbia, one of the best preserved gold rush mining towns in the Sierras, was designated a National Historic Landmark in 1961. A party of miners led by Dr. Thaddeus Hildreth discovered gold on March 27, 1850. Almost overnight a mining camp with over a thousand prospectors was established on the future site of Columbia. The Columbia Basin mining district was one of the riches gold producing regions in California. Although many mining camps disappeared after the mines played out, Columbia became a successful community. Fires spared only a few frame and brick buildings in 1854 and again in 1857. Most of the buildings built after the 1857 fire were brick. Columbia reflects a California mining town for the period of 1854 to 1858. Thirty-nine buildings including hotels, saloons, restaurants, banks, offices, stores, residents, fraternal halls, churches, fire houses, and a school remain in the historic district. Today the living historic town continues with a mixture of park properties, small businesses, and residents providing visitors an opportunity to experience California’s diverse history. National Historic Landmarks (NHLs) are nationally significant historic places designated by the Secretary of the Interior because they possess exceptional value or quality in illustrating or interpreting the heritage of the United States. Designated a National Historic Landmark in 1970, the Commander’s House, also known as the Rotchev House, is an excellent and rare example of Russian log architecture in the United States. The log house appears to have been an early Russian cabin that was modified in 1836 to house the last settlement commander, Alexander Rotchev. Fort Ross, a fur and agricultural settlement, was established by the Russian American Company in 1812. The Russian outpost provided food by trade and production to the Russian-American Company’s colony in Sitka, Alaska, as well as sea otter pelts and ship building. The settlement was active until 1841 when it was sold to John A. Sutter. While much of the fort was dismantled and sent to Sutter’s Fort in Sacramento, the Rotchev House was left intact and occupied by subsequent land managers. Alexander Rotchev, his wife Elena, and their three children, Olga, Elena and Konstantin, lived here from 1838 to 1841. Alexander Rotchev was an intelligent, well-educated, and well-traveled man of the arts who took a position with the Russian American Company to support his wife, Princess Elena Pavlovna Gagarina, a descendant of the titled nobility, and their growing family. National Historic Landmarks (NHLs) are nationally significant historic places designated by the Secretary of the Interior because they possess exceptional value or quality in illustrating or interpreting the heritage of the United States. The site of the Donner Party Camp was designated as a National Historic Landmark in 1961 for its significance in the settlement of the West. George Donner and James Reed led 89 emigrants in a wagon train bound for California into the Sierra Nevada Mountains in the winter of 1846/1847. After delays in Nevada where the group lost both wagons and cattle, the emigrants continued their journey attempting to cross the High Sierras in the late autumn. However, the heavy November snows of the High Sierras forced the party to establish a camp for the winter. The harsh conditions and lack of food provisions led to the tragic loss of nearly half of the group. By December the food stores were nearly depleted and several members of the group left to seek help. The first of four relief expeditions from California did not reach the camp until February 1847. After the four month ordeal, only forty-seven members survived. Today visitors can camp, fish, and picnic at the park, as well explore Native American life, the 1840s emigration, the Chinese railroad builders, and auto travel at the visitor center. National Historic Landmarks (NHLs) are nationally significant historic places designated by the Secretary of the Interior because they possess exceptional value or quality in illustrating or interpreting the heritage of the United States. Designated in 1981, the Folsom Powerhouse provided the first long distance transmission of power. In 1895, when the powerhouse was put into service it represented a significant advance in the science of generating and transmitting electricity. The powerhouse utilized a water driven engine and the American River to spin coils of copper wire between magnets to produce an electric charge. Today one can view the penstocks, turbines, and huge transformers that made this transfer of power possible and learn about power generation and electric current at the visitor center. National Historic Landmarks (NHLs) are nationally significant historic places designated by the Secretary of the Interior because they possess exceptional value or quality in illustrating or interpreting the heritage of the United States. Designated as a National Historic Landmark in 1961, Fort Ross was the largest single Russian trading center outside of Alaska. The Russian American Company established Fort Ross as a fur and agricultural settlement in 1812. The Russian outpost provided food by trade and production to the Russian-American Company’s colony in Sitka, Alaska, as well as sea otter pelts and ship building. The settlement was active until 1841 when it was sold to John A. Sutter. While much of the fort was dismantled and sent to Sutter’s Fort in Sacramento, the Rotchev House was left intact and occupied by subsequent land managers. The settlement brought together Russian, Native-Alaskan, and Native American people on the California coast. The fort continued to be a center of trade and agricultural production after the Russians left. Having changed hands several times, the land was purchased by the George and Mercedes Call in 1873. George Call operated 2,500 acres of ranch lands and orchards as well as a shipping company. He built a residence for his family, a school house for his nine children, and a variety of barns and out buildings. Although, George Call sold the 2½ acres comprising the fort and its buildings to the California Historical Landmarks League in 1903, the Call ranch was held as one property until the last of the Call children died in 1976. Today, Fort Ross State Historic Park offers visitors many opportunities to explore the diverse history of Russian Settlement, Native American and Alaskan cultures, Californian ranching and agriculture, as well as underwater exploration of sunken ships. National Historic Landmarks (NHLs) are nationally significant historic places designated by the Secretary of the Interior because they possess exceptional value or quality in illustrating or interpreting the heritage of the United States. Designated as a National Historic Landmark in 1976 for its architectural significance, the Hearst San Simeon Estate was designed by Julia Morgan in collaboration with William Randolph Hearst. Born in 1863, the son of banking magnet George Hearst, William Randolph Hearst grew up in San Francisco. Introduced to journalism at Harvard University, Hearst took over one of his father’s newspapers after he left school. Publishing became a passion and a tool to influence politics and fund Hearst’s interest which included in the development of his family’s camping spot into the iconic Hearst Castle. Constructed over the decades between 1919 and 1951, the residence was never complete. Hearst worked closely with architect Julia Morgan, changing and expanding elements of the design as construction progressed. Also born in San Francisco, Julia Morgan was the first female architect to be licensed in California. Morgan was provided a treasure trove of art and historic artifacts collected from around the world by Hearst that both inspired her design but also challenged her technical expertise. Incorporating ancient and medieval elements into new construction demanded both an understanding of construction historic and modern materials and techniques but also a consideration of scale and design. Today, La Cuesta Encantada, now known as Hearst Castle, houses one of the finest art collections on the West Coast and is accredited by the American Alliance of Museums. National Historic Landmarks (NHLs) are nationally significant historic places designated by the Secretary of the Interior because they possess exceptional value or quality in illustrating or interpreting the heritage of the United States. Designated as a National Historic Landmark in 1962, Jack London’s Wolf House (1913), his wife Charmain’s House of Happy Walls (1919) and their graves are located amongst the fields and agricultural buildings of the Londons’ Beauty Ranch. John Griffith London (1876 – 1916) grew up in poverty in Oakland, California. At the age of 17, he left home to crew on a sealing ship and began a life of adventure. London’s experiences and observations during his travels inspired and colored his many articles, short stories, and novels, making him the most popular author of his time. A prolific writer, London completed 51 books, hundreds of short stories and articles from 1900 until his death in 1916. Many his works were completed at the Beauty Ranch which he purchased in 1905. The Beauty Ranch was first developed by Louis Csomortanyi as the Tokay Vineyard in 1859. Cottage, out buildings and winery were later constructed. Charles and Henry Kohler purchased the property in 1866, making a number of improvements and using the property at the center of operation for Kohler and Frothing. The Kohlers created a model modern winery with vast land holdings throughout Sonoma. The property was again transformed as a model of modern agricultural production, when London applied scientific and ancient techniques in crop and animal production. Today, visitors can explore the winery buildings, as well as the agricultural and literary pursuits of Jack and Charmian London. National Historic Landmarks (NHLs) are nationally significant historic places designated by the Secretary of the Interior because they possess exceptional value or quality in illustrating or interpreting the heritage of the United States. The Castro Adobe was designated as a National Historic Landmark in 1970 as a significant example of 19th centuryMonterey Colonial architecture. Completed in 1841, the Castro Adobe is one of the best examples of Monterey Colonial architecture, with a mix of adobe and timber framing. Juan Jose Castro, son of one of the original members of the De Anza Expedition, constructed the two-story hacienda which served as headquarters for the 8,800-acre Rancho San Andres. A grand specimen of residential architecture from the Mexican Rancho period (1821-1848), the adobe was considered the most lavish residence in Santa Cruz County, featuring the first dance floor (fandango) and indoor kitchen in the region. Today adobe is the only remaining building of the Rancho era in the Pajaro Valley and is being preserved and interpreted though a partnership between California State Parks and Friends of Santa Cruz State Parks. National Historic Landmarks (NHLs) are nationally significant historic places designated by the Secretary of the Interior because they possess exceptional value or quality in illustrating or interpreting the heritage of the United States. Designated as a National Historic Landmark in 1970 for its significance as an outstanding example of a restoration of a mission complex, La Purisima Mission was the first place that archeology was applied to a restoration effort. At the site of the future town of Lompoc, Father Presidente Fermin de Lasuén founded Misión La Purísima Concepción De María Santísima (Mission of the Immaculate Conception of Most Holy Mary) on December 8, 1787 as the 11th of 21 Franciscan Missions in California. The mission complex was laid out in the standard format established in the earlier missions. However, in 1812 the adobe buildings failed during an earthquake. Upon application, the Pope granted permission to move the mission to a nearby valley. Reconstructed with a unique plan, the mission developed large agricultural holdings and baptized several thousand Chumash Indians into the Catholic Church. As the mission prospered over 100 large and small adobe buildings were a water system was constructed. In 1834 the Mexican government secularized all mission properties, including La Purisima. Although some of the large buildings were used over the years for private ranching operations, the buildings fell into disrepair. A hundred years after secularization, La Purisima became the site of one of the largest preservation efforts in the United States. The New Deal funded Civilian Conservation Corps, with the guidance of the National Park Service, to stabilize the surviving buildings, conduct exhaustive research and archeology, and reconstruct many of the buildings and structures that had been lost over time. Today La Purisima State Historic Park evokes a time when California was a frontier where old and new world orders struggled for survival. National Historic Landmarks (NHLs) are nationally significant historic places designated by the Secretary of the Interior because they possess exceptional value or quality in illustrating or interpreting the heritage of the United States. Designated in 1960, the Larkin House is significant as the prototype for the Monterey Colonial style of architecture and one of several National Historic Landmarks in the Monterey State Historic Park. Thomas Oliver Larkin, a thirty-year old merchant and builder from New England came to Monterey in 1832. He quickly became an influential community leader and established a prosperous business in commerce and real estate development throughout California. Larkin began constructing a home for his growing family in 1835, applying traditional architectural forms to the local materials. The adobe residence was completed in 1837 with a design that incorporating timber supports for the upper story, allowing a lighter shell of adobe bricks and greater flexibility in window placement than in traditional adobe construction. In 1843, Larkin was appointed as the first United States Consul in California which was governed by Mexico and played an important role in the annexation of California by the United States. After statehood was granted to California, Larkin sold his Monterey property. It was reacquired by the Larkin family in 1922 and sequentially donated to the State of California in 1957. Today, the home and gardens are open weekly to visitors of the Monterey State Historic Park. Locke Boarding House is a contributor to the Locke Historic District, a Chinese-American Community established in 1915 and designated as a National Historic Landmark in 1990. More than fifty remaining commercial and residential buildings constitute the village of Locke, the largest and most intact surviving example of an historic rural Chinese-American community in the United States and the only remaining example in the Sacramento-San Joaquin River Delta. Once known as the Jack Ross Boardinghouse, Locke Boarding House was constructed in 1909, prior to the formal development of the town. Chinese men working on the construction of the Southern Pacific Railroad boarded in the small establishment which was located near the Southern Pacific Railroad shipping warehouse. The Kuramoto family operated the boarding house from 1921 until they were interned during World War II in 1942. Today, the boarding house is a museum that provides visitors a glimpse into the past. One of only two Recreational Demonstration Areas (RDA) constructed by the WPA west of the Mississippi, Mendocino Woodlands is one of the best remaining examples of the group campgrounds designed to provide recreational opportunities on previously depleted agricultural or logged land. The rustic-style camp buildings and cultural landscape was designated a National Historic Landmark in 1997. Funded by the New Deal legislation of 1933, the National Park Service developed the idea of RDAs which drew upon two movements, agriculture and social reform. Over exploited land, either farm or forestry land was restored to combat soil erosion which contributed to the dust bowl effect in America’s heartland, was chosen for RDAs. Park designers were focused on developing parks that would provide group camping opportunities to underserved, intercity, and lower income communities. The buildings reflect the inspiration for the idea of restoration through nature, build of local redwood logs and stone in the park rustic style. While forty-six RDAs were developed, only two were located on the west coast. Today, Mendocino Woodlands continues to provide groups the opportunity to commune with nature and escape from everyday concerns. National Historic Landmarks (NHLs) are nationally significant historic places designated by the Secretary of the Interior because they possess exceptional value or quality in illustrating or interpreting the heritage of the United States. The mills are a contributor to the Mission Santa Ines National Historic Landmark District. Designated in 1999, Mission Santa Ines is one of the nation’s best preserved Spanish mission complex. Founded in 1804, Santa Ines was the 19th out of 21 Spanish missions in Alta California. The historic district includes an authentic rural setting, original buildings, industrial structures, archeological remains, and collections of art and interior furnishings. Located in the Santa Ynez Valley, Mission Santa Ines lay between the existing missions of Santa Barbara and La Purissima. The mission was arranged in the standard quadrangle, with church buildings on one wing, the padres residences, offices, and work rooms on another, and the dormitories, shops, work rooms, granaries, and storage areas making up the last two wings. Due to the diversity of the facilities and capacity of the reservoirs, the mission’s mill complex and reservoirs are unsurpassed by that of any other California or southwestern mission. Constructed of stone and lime mortar, the complex features two water driven mills, a fuller mill to process wet woolen cloth into a finer textile and a grist mill for grinding grain into flour. Today, the mission continues to be an active parish offers a variety of tours. The mills are owned by California State Parks but managed by Santa Barbara Trust for Historic Preservation, who offers tours by appointment only. California State Parks has several buildings, such as the Old Custom House, the Larkin House and the First Theater, that are contributors to the Monterey Old Town Historic District. In 1970, two hundred years after the founding of the presidio, the district was designated as a National Historic Landmark as the Spanish and later Mexican capital of California from 1776 to 1848. The discontinuous district consists of twenty-one residential, commercial, and public adobe buildings dating from 1814 to 1855. Today, visitors can tour the California State Park owned properties within the historic district in between shopping and eating in the historic core. National Historic Landmarks (NHLs) are nationally significant historic places designated by the Secretary of the Interior because they possess exceptional value or quality in illustrating or interpreting the heritage of the United States. Old Sacramento Historic District was designated a National Historic Landmark in 1965 as a commercial center from the gold rush era. The Sacramento River was the major transportation route for people and goods during the gold rush and until the development of rail in California. The first track was laid to Sacramento in 1852 and while rail lines connected various communities within the state from 1852, the transcontinental railroad linking the west to the east was not completed until 1869. With the development of the transcontinental railroad, the river port of Sacramento continued to be a vital hub of commerce for the state. California State Parks maintains two of the remaining contributing seven buildings, the BF Hastings Building/Pony Express Terminal, and the Big Four Building. Both of these buildings are also individually designated as National Historic Landmarks. Today, Old Sacramento reflects a time when the river port was the gateway to the gold rush. Visitors can wander down the cobble stone streets and visit a variety of shops and restaurants in between the exploring the California State Railroad Museum and the other historic museums throughout the historic district. The Petaluma Adobe was completed in 1846 and is the largest existing example of residential adobe architecture. The two-story Monterey Colonial style residence was designated as a National Historic Landmark in 1970. Salvador Vallejo constructed the adobe over a nine year period for General Mariano Guadalupe Vallejo, his older brother. General Vallejo was sent to California by the Mexican government and for his service he was granted 66,000 acres which he operated as a rancho. While Vallejo resided in Sonoma, the Petaluma Adobe was the headquarters of his ranch. It provided living space for ranch supervisors on the second floor and factory operations on the first floor. Unlike most ranchos which operated using individual buildings for specific tasks, the work areas for Vallejo’s ranch were all located under the same roof. A Native American village, which housed the ranch workers, was located nearby. In the early years the ranch supported the needs of Vallejo’s troops and financed his other interests after statehood. However after the gold rush, cost rose and the ranch became increasingly less profitable. Vallejo sold the building and some of the property in 1857. Today, environmental living programs and tours bring California’s early history alive for school children and visitors. The BF Hastings Building was the western terminus of the Pony Express from April 1860 to March 1861. Designated as a National Historic Landmark in 1961, at one time the building also housed the State Supreme Court and Wells, Fargo and Company. The two-story brick building was constructed after the devastating 1852 fire which destroyed most of the business district. Benjamin F. Hastings constructed the building and rented it to Wells, Fargo, and Company, who occupied the building from 1854 to 1858. The State Supreme Court occupied the second floor from 1854 until a new facility was constructed in 1869. The building also housed offices of the Theodore D. Judah chief engineer for the Sacramento Valley Railroad, the state’s first railroad. Restored in the 1970s, the BF Hastings building is an important contributor to the Old Sacramento Historic District. Today, visitors can explore the Wells Fargo History Museum and Old Sacramento Visitor Center which currently occupies the building. National Historic Landmarks (NHLs) are nationally significant historic places designated by the Secretary of the Interior because they possess exceptional value or quality in illustrating or interpreting the heritage of the United States. The San Juan Bautista Plaza Historic District was designated a National Historic Landmark in 1970 as an excellent representation of a 19th century village. The historic district of San Juan Bautista Plaza consists of five buildings, including the mission church, Plaza Hotel, Castro House, Plaza Hall, Plaza Stables, constructed on a traditional Spanish-Mexican colonial plaza. The first building, the San Juan Bautista Mission Church (1803-1813) is the largest out of the 21 Spanish mission churches and has continually been operating as a Catholic Church since 1812. After the missions began secularized by the Mexican government in 1834, mission lands were granted to Mexican citizens and soldiers. José Tiburcio Castro, a former Spanish soldier, received San Juan Bautista Mission lands, sold and divided much of the land among his family and friends. The José Castro House (1839-1841) was constructed for his son, José Antonio Castro. The other buildings, the Plaza Hotel (1858), the Plaza Stables (1861), and the Plaza Hall (1868), represent a great economic boom period from 1850 to the 1870s for the area. Today, the five adobe and redwood buildings are open to visitors and feature interpretive programs for all ages. The site of the raising of the Bear Flag during the revolt of 1846, Sonoma Plaza was designated a National Historic Landmark in 1960 and consists of twelve one and two story buildings from the Mexican Period. California State Parks manages several of the district contributors including the Sonoma Barracks, Toscano Hotel, kitchen and annex, the site of Casa Grande, Casa Grande servants quarters, the Blue Wing Inn and the Sonoma Mission. The last of the Spanish missions in California, the Sonoma Mission was founded in 1823. After Mexico won its independence, the government began to secularize the missions it 1834. The Sonoma Pueblo was established as a Mexican military base in 1835 in response to Russian settlement at Fort Ross. General Mariano Guadalupe Vallejo oversaw the settlement of the mission property and the military operation. Today, the plaza features a mixture of religious, military, and commercial properties that testify to the important role that Sonoma played in California’s history. National Historic Landmarks (NHLs) are nationally significant historic places designated by the Secretary of the Interior because they possess exceptional value or quality in illustrating or interpreting the heritage of the United States. Designated an National Historic Landmark in 1987, the Leland Stanford House represents both an excellent example of Renaissance Revival architecture and the life of Leland Stanford, governor and senator of California, rail road industrialist, one of the “Big Four” who built the transcontinental railroad, and founder of Stanford University. Architect Seth Babson designed the original house for Sacramento merchant Shelton C. Fogus. When completed in 1857, the residence was a simple square block house with five symmetrical bays. The Stanfords purchased the home in 1861, just prior to Leland Sanford’s first term as governor of California. An extensive renovation of the house in 1871 raised the building and added an additional floor below, tripling the size of the original house. The building was further renovated when it was donated to the Catholic Church by the Stanfords and housed an orphanage. California State Parks returned the building to its 1871 design and it currently host’s events for the California governor’s office, international dignitaries, and is open for tours. National Historic Landmarks (NHLs) are nationally significant historic places designated by the Secretary of the Interior because they possess exceptional value or quality in illustrating or interpreting the heritage of the United States. Sutter’s Fort represents the first pioneer settlement in Sacramento and was designated a National Historic Landmark in 1961. John Augustus Sutter was a man of action and opportunity. Sutter came to the United States from Germany at the age of 31. He traveled widely across the continent and beyond, arriving in Yerba Buena, California in 1839. By 1840, Sutter became a naturalized citizen of Mexico with permission to found a settlement in the Central Valley. He constructed an adobe with Native American labor on a small rise near the confluence of the American and Sacramento Rivers. Sutters’s Fort was the first piece of his empire which would include a 50,000 acre land grant, Sutter’s mill gold was discovered creating a global migration to California, and Fort Ross, the Russian agricultural and ship building colony. After the discovery of gold, John Sutter signed his Sacramento holdings over to his son, John A. Sutter, Jr. His son began to organize the residences and helped found Sacramento City. Poor health kept Sutter, Jr. home bound for many years, allowing Sutter’s Fort to fall in disrepair. Following his death in 1897, the Native Sons of the Golden West rallied to save the historic site which had been reduced to one building and remnants of the walls. The Native Sons purchased the fort in 1890 and the State of California completed its restoration in 1893. The fort has been an important part of the California State Park system since 1937. Today it is open to the public for tours and thousands of school children visit each year. National Historic Landmarks (NHLs) are nationally significant historic places designated by the Secretary of the Interior because they possess exceptional value or quality in illustrating or interpreting the heritage of the United States. The oldest buildings in California, the US Custom House was one of the first historic sites to be designated a National Historic Landmark in 1960. The Mexican government constructed the oldest portion of the two story adobe building in 1827 as two-room, one story building to collect custom duties on British, American, and South American goods shipped into Monterey Bay. American Trader and entrepreneur Thomas Larkin, under contract with the Mexican government, expanded the building in 1841 and again between 1843 and 1846. The first American flag was raised to proclaim California as part of the United States at the Custom House on July 7, 1846. The structure continued its civic function as a United States custom house from 1848 to 1868. It was later occupied as a residence and the as lodging rooms after being restored by the Natives Sons of the Golden West in 1900. Incorporated into the California State Park system in 1930, today the Custom House is open to the public for tours and part of the Monterey State Historic Parks. National Historic Landmarks (NHLs) are nationally significant historic places designated by the Secretary of the Interior because they possess exceptional value or quality in illustrating or interpreting the heritage of the United States. Designated a National Historic Landmark in 1997, the United States Immigration Station, Angel Island was the primary West Coast portal for immigrants to enter the United States from 1910 to 1940. During World War II the facility was used as a Prisoner of War Camp housing German and Japanese prisoners of war and members of the Italian Service Unit. Declared obsolete in 1946, the Angel Island became a state park in 1963. The majority of immigrants processed and detained at the Immigration Station came from Asia, including China, Japan, India, and the Philippines. Discriminatory practices against Asian immigrants led to brutal treatment during grueling weeks of testimony over the months of detention. Today the Immigration Station at Angel Island State Park stands as a reminder of the trials immigrants suffered to enter the United States and contributes to the healing process while interpreting the diverse cultures that contribute to our nation. National Historic Landmarks (NHLs) are nationally significant historic places designated by the Secretary of the Interior because they possess exceptional value or quality in illustrating or interpreting the heritage of the United States. 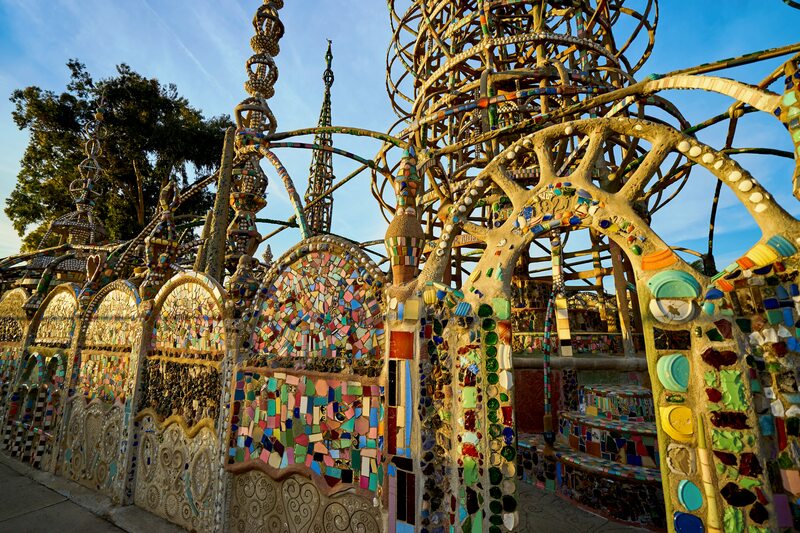 Designated a National Historic Landmark in 1990 as an important work of folk art that is both sculpture and architecture, Watts Towers were created by Italian immigrant Simon Rodia over a period of 33 years. In the space that was once Rodia’s garden and around his house he created a monumental work of mosaic. Rodia collected seashells, ceramics, glass, and other materials to dress the metal spires he constructed from pipes and pieces of iron and steel. Below the towers are walls, an entrance, ship sculpture and gazebo. His personal mission became public inspiration as the delicate spires soar over the rooftops of the Watts neighborhood. Upon completing the towers in 1954, Rodia gave a friend his property and he left. The house burned down in 1955 and a protracted battle to save the towers from destruction was concluded in 1959. Today Watts Towers is the smallest park in the California State Park system. It is managed in partnership by the City of Los Angeles and is the site of a popular annual music festival.